The fresh peach season is here. Preserve some of these delicious peaches this year by drying them. I love dried peaches to snack on, they are just like candy and they are also great in oatmeal and cooked desserts. 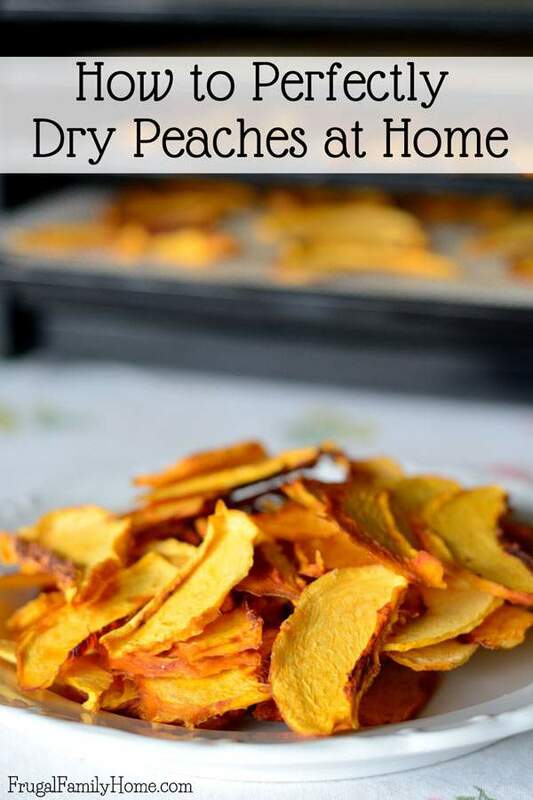 If you’ve never dehydrated peaches, it’s an easy process this is how to dry peaches at home. I love fresh in season peaches. They taste so good and you don’t have to worry about them being spongy inside, like some of out of season peaches. I remember going out to the farm and picking peaches with my mom when I was young. I took my daughter peach picking when she was young too. Unfortunately, the farms we used to pick peaches at are all closed. But I do the next best thing and pick up peaches at our local farmers market. I get delicious produce from farms that are close to home. I used to purchase dried peaches at the store. They were a great snack but when you look at the preservatives on them, it will make you run away from them. I quit buying them because I didn’t want my kids eating those preservatives. For a while, we just didn’t eat dried peaches at all. So you know some of the links in this post are my referral links. Which means when you use them I might make a little money at no extra cost to you. You can read more on my disclosure policy. Then one day at a rummage sale I spotted a food dehydrator for just $5 still in the original box and it looked brand new. It was a fabulous find, like the all leather purse I found brand new at a yard with the $100 price tag still on it for $5. Yes, it was one of those kinds of yard sale finds, that make me so happy. Getting back to my first $5 rummage sale dehydrator, with my first dehydrator I started learning how to dry all kinds of fruits and vegetables. We found we love all kinds of fruits dehydrated. They are just like candy from nature and peaches are one of our favorites. We’ve also made dehydrated watermelon in the past and it turns out just like taffy. So very good! I now have an Excalibur dehydrator that I save up to buy a few years ago. It works much better than my first dehydrator because the fan is in the back blows the air evenly over each of the trays. If you are looking to purchase one I would definitely recommend you consider an Excalibur. I also love how easy the Excalibur trays are to clean. The screen mesh on the trays is flexible, which makes removing the dried fruit so much easier, than pulling it off the fixed ridge trays of my first dehydrator. But either dehydrator will work for drying peaches. You can even use an oven. I’ve included how to use an oven to dehydrate peaches below too. When shopping for your peaches, try to purchase freestone peaches. The freestone peaches are so much easier to remove from the pit, making this whole process easier. If you end up with cling peaches, don’t worry you’ll just need to cut the slices off the pit. Because cling peaches, cling to the pit. You’ll also want to select ripe but not overripe peaches to dehydrate. If the peaches are hard the flavor won’t be very good and overripe peaches can end up spongy and not dehydrate as well. Plus nice perfectly ripen peaches peel more easily. To ripen your peaches, place them in a box in one layer and add a ripe banana to each box. It helps to ripen the peaches more evenly. Often I purchase my peaches and have to wait a day or up to a week for them to get ripe. Make sure to clean your work area before you start. You don’t want any cross-contamination from other things. Then you want to clean the peaches. I usually place the peaches in the clean sink and fill the sink with water to wash them. Then gather your supplies. After the peaches are all clean you’ll want to peel them. I find that peeled peaches dry better. Also if you’ll be rehydrating them to use in cooking you won’t have any tough peach skins coming off in the dish. If your peaches are perfectly ripe, you can probably peel them fairly easily with a sharp knife. 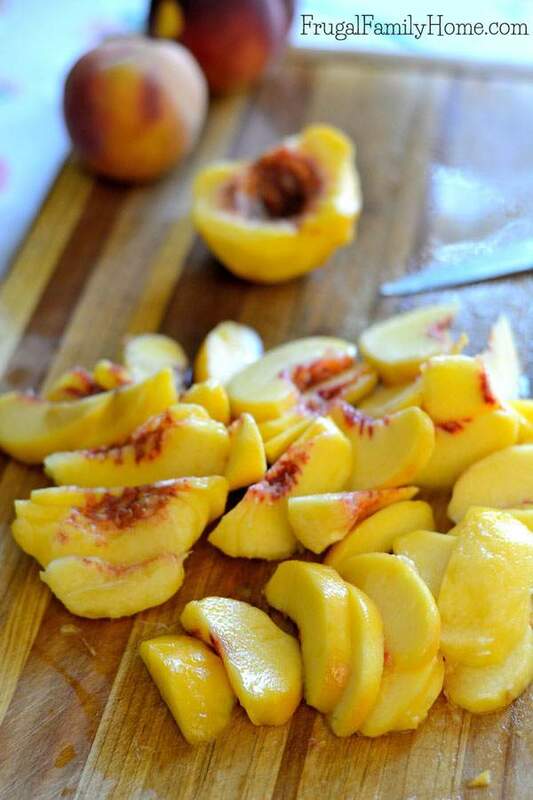 Another way to peel peaches is to boil them for a few seconds to split the skins. To use this method, put a pan of water on the stove and bring it to a boil and place one to three peaches in the water at a time. Keep a close eye on them, you don’t want to cook them. As soon as you see the skins split, remove the peach from the pan of boiling water and place in a bowl of ice water and let cool. After cooling the skins should slip right off. I’ve found that both methods take about the same time. But when you boil the peaches to remove the skin, the peaches have fewer cut marks in them and are a little prettier. I peel the peaches then cut the peach in half and give a little twist to remove the pit. Once the peaches are halved I turn them cut side down and slice the peach slices into the same thickness. It’s important to keep the slices the same thickness so they are will dry at the same rate. If some are too thick and some are too thin, the thin ones will dry faster and you’ll have to remove those and keep drying the rest. I’ve found it easier to take the time to get them the same thickness so the peaches all dry at the same rate. As I have enough peach slices for a dehydrator tray, I add them to it and place the tray into the dehydrator. I set the temperature to 135 degrees. I continue to add peaches to the other trays and add them to the dehydrator when full. 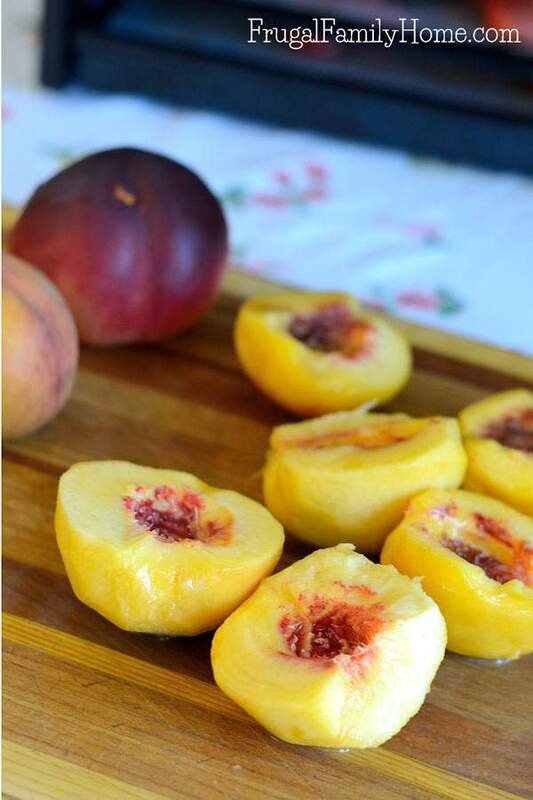 If you are concerned about the peaches turning brown while dehydrating you can soak them in a salt solution, lemon juice solution, or soak them in a presoak of Fruit Fresh. The salt water is a cheap way to keep the peaches from turning brown. Add 2 tablespoons of salt to 8 cups of water and stir. Then add the peaches as you slice them. I don’t ever bother to presoak mine but I wanted to add this tip just in case you didn’t want your peaches turning brown. Let the peaches dehydrate until they are chewy but not squishy. You may want to cut one or two in half to check for any moisture pockets. If no moisture pockets remain the peaches are ready. It usually takes around 6-24 hours to dehydrate peaches in my dehydrators depending on thickness. 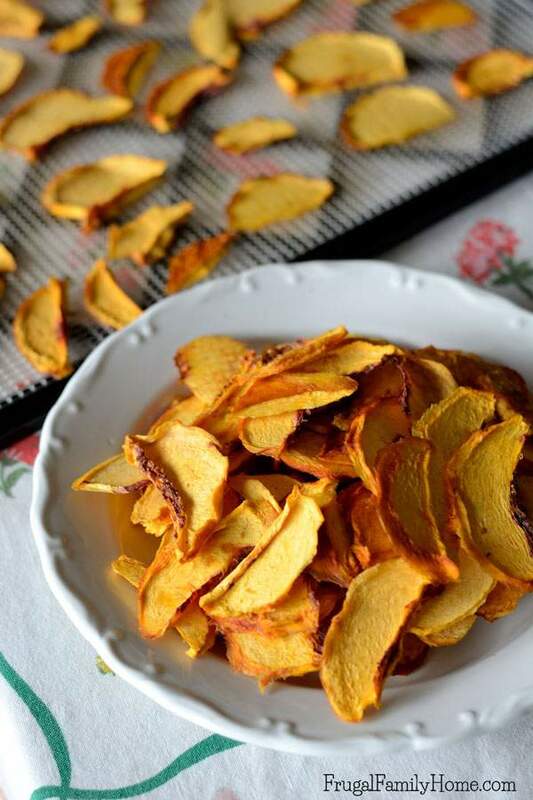 If you don’t have a dehydrator you can use an oven. Just follow the steps above to prepare the peaches. You may want to presoak you peaches to keep them from turning brown. Set your oven to around 170 degrees to preheat while preparing the peaches. I know the lowest setting I have on my oven is 200 degrees which should work also. Place the prepared peaches onto cookie sheets and onto the oven racks. Leave the oven door slightly ajar and let the peaches dry for about 6-8 hours or until no moisture pockets remain. Once the trays are removed from the oven or dehydrator you want to fully cool the dried peaches before adding them to storage containers. If you used the oven method of drying, let your trays set overnight before packaging the peaches. 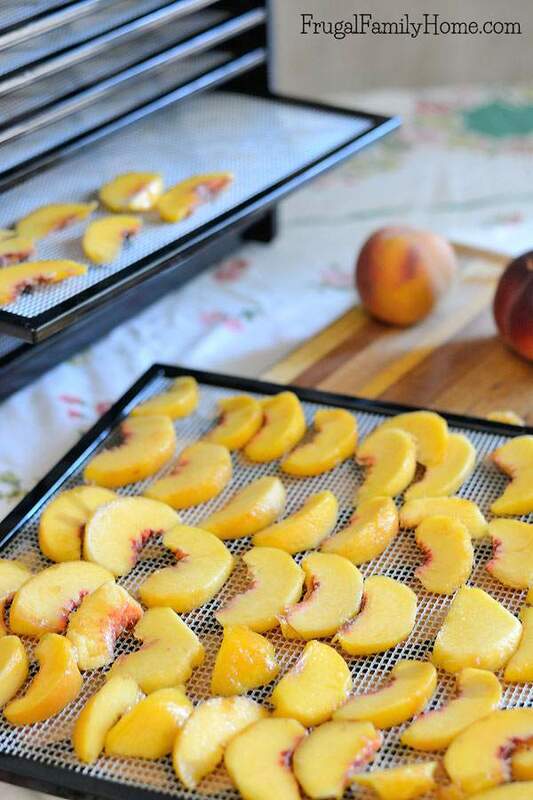 For peaches that are dried in the dehydrator, let them cool fully. You don’t want warm dry peaches going into bags, they will draw moisture. Which can ruin them. After the peaches are fully cooled, remove them from the cookie sheet or dehydrator trays. If you own an Excalibur you can pull the corners of the mesh tray and bring into a circle to help release the peaches. It works really great. My favorite way to store peaches is vacuumed sealed. I use a Food Saver to vacuum pack my dry peaches. Another option is to store the dry peaches in canning jars with the rings and bands. I also add oxygen absorbers 100cc for a quart sized jar or bag. That’s how I dry peaches each year so we can enjoy that great in season peach taste at other times of the year too. 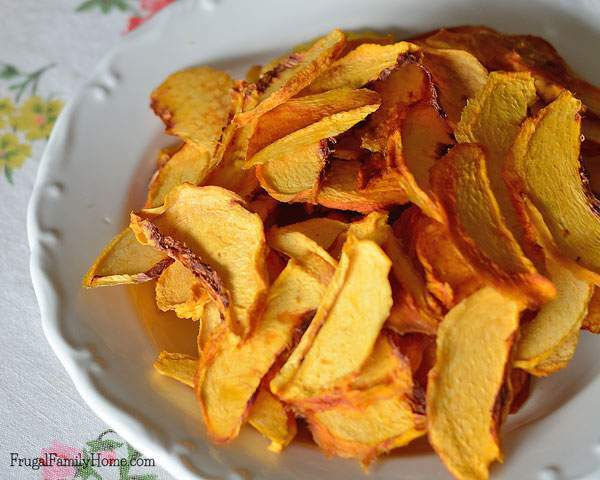 We enjoy our home dried peaches all winter long as snacks or in oatmeal. You can rehydrate them too for recipes. 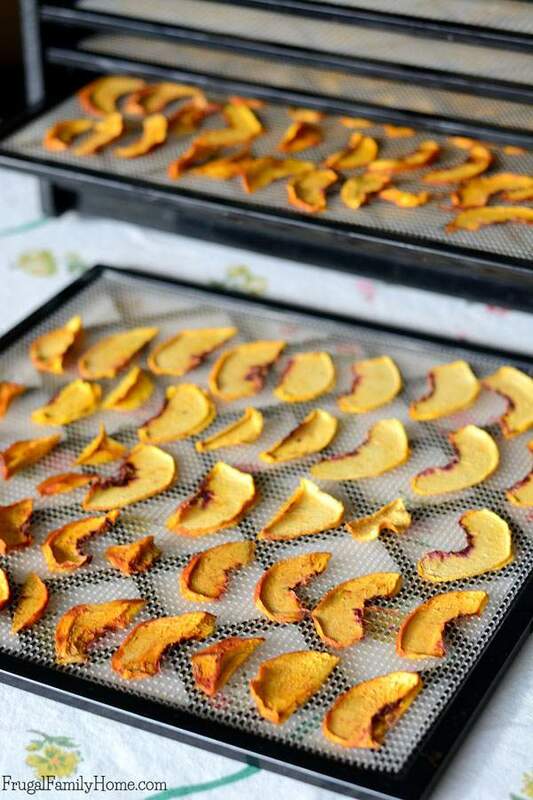 Have you ever tried dehydrating fruit before? We are having a great summer Sandra! I hope your family’s summer is going well too. I’ve never tried dehydrated peaches before, but they sound so good! The peaches in our area are not very good compared with the ones I grew up eating in California. Even the ones from the farmer’s markets aren’t very good. I sometimes splurge and pay for the ones imported from CA, but they are rather pricey, so that’s a rare treat. We are really lucky here to have such great peaches available locally. I’m sorry to hear your local peaches just aren’t as good. It’s hard when you are used to eating good fruit and then you can’t get them locally. It reminds me of an old Seinfeld show about Macintosh peaches being so great from the west coast. How they looked forward to them. It must really be true that the peaches on the east coast aren’t as good. I thought it was just part of the show. I need to purchase more peaches to dry and can this year soon. We always run out of the dried peaches first since our whole family loves them. I have a question… How thick or thin do you cut your peaches? Do you have a formula of thickness and time? Carolina, I don’t have a formula. I slice them about 1/4 to 1/2 inch thick and then dry until they are dry. I hope that helps. I used this recipe but also added a soft sprinkling of cinnamon sugar on the peaches prior to drying them….they were incredible and have had requests for more. Nan, thanks for sharing your tips about adding cinnamon sugar to the peaches. I’m going to give it a try when I dry peaches soon. Thanks!